£25,000 Energy Makeover for Chorlton CE Primary! 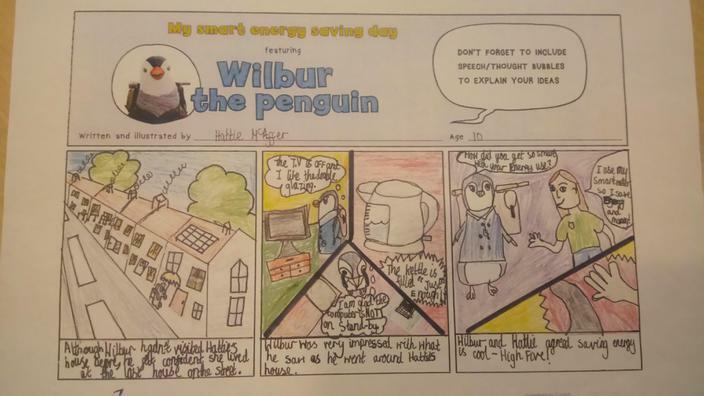 We are delighted to announce that Hattie McAffer in year 6 has been named as the runner up nationally in the Smarter Energy Competition with British Gas. Not only did Hattie win herself an iPad, a Wilbur toy and the school and Einstein tablet, she has also won us a huge £25,000 energy makeover! This means the school will receive an energy survey and improvements will be made whether it be lighting, windows, solar panels to make us more energy efficient. We are so proud of you Hattie and thrilled to win such an amazing prize. Hattie's excellent comic strip below won the prize.